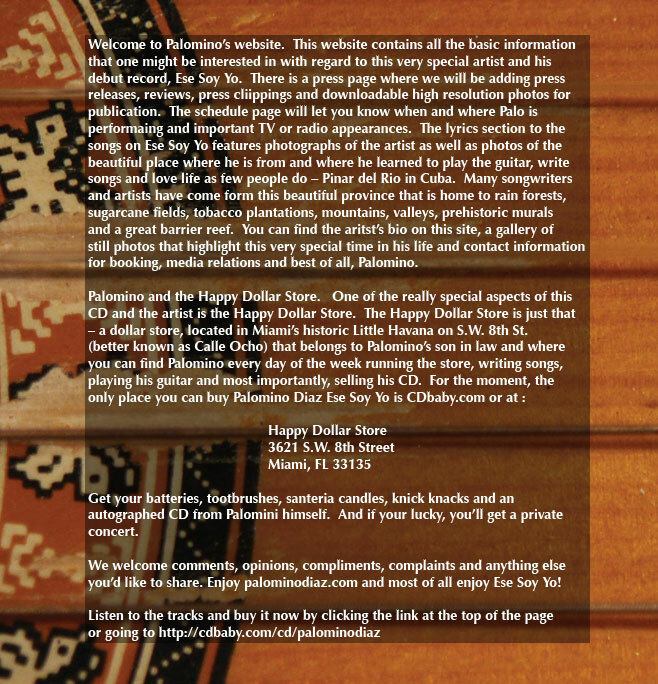 Palomino Diaz, Latin Jazz Cuban Musician debut CD "Ese Soy Yo"
Welcome to Palomino's website. This website contains all the basic information that one might be interested in with regard to this very special artist and his debut record, Ese Soy Yo. There is a press page where we will be adding press releases, reviews, press cliippings and downloadable high resolution photos for publication. The schedule page will let you know when and where Palo is performaing and important TV or radio appearances. The lyrics section to the songs on Ese Soy Yo features photographs of the artist as well as photos of the beautiful place where he is from and where he learned to play the guitar, write songs and love life as few people do - Pinar del Rio in Cuba. Many songwriters and artists have come form this beautiful province that is home to rain forests, sugarcane fields, tobacco plantations, mountains, valleys, prehistoric murals and a great barrier reef. You can find the aritst's bio on this site, a gallery of still photos that highlight this very special time in his life and contact information for booking, media relations and best of all, Palomino. Get your batteries, tootbrushes, santeria candles, knick knacks and an autographed CD from Palomini himself. And if your lucky, you'll get a private concert. We welcome comments, opinions, compliments, complaints and anything else you'd like to share. Enjoy palominodiaz.com and most of all enjoy Ese Soy Yo! Listen to the tracks and buy it now by clicking the link at the top of the page or going to CDbaby.com.